All Arkansas Super-Prestige races are sanctioned by USA Cycling (USAC), the national governing body for bicycle racing. There are a lot of advantages--some obvious, some not so obvious--that come from this arrangement, but we won't get into that here. USAC-sanctioning means that all ASP racers must hold a USAC license, which you can either pay for annually ($60) or race-by-race ("one-day", $10 per event). I can see all of you reaching for your slide rules; an annual license pays for itself after six races. When you purchase an annual license, you have to choose the blue pill (Road/Track/CX) or red pill (Mountain Bike/CX), or you can pay an extra $30 and get both pills (Road/Track/Mountain Bike/CX). No matter which you choose, you still get CX! When you first purchase a license, whether annual or one-day, you are assigned to CX category 4. If you're the ambitious sort and want some day to upgrade to cat 3, you'll want an annual license because (1) your race results accumulate and are tracked by your license number and (2) you can't upgrade to cat 3 without an annual license. On the other hand, there are many people who happily do a few races per year on one-day licenses, and that's cool too. Clear as mud? Awesome. Let's race. Have received word that Skills-n-Drills will be held Monday evenings in September at Allsopp Park. This will be a great opportunity for riders of all levels to learn, practice, and hone their CX-specific skills. It is not a hot-laps session. Details to come. "Microcross is a practice cyclocross session. It is free to anyone and allows riders to practice the skills needed to compete in cyclocross racing." It's put on by Highroller Cyclery and runs Thursday evenings. Looks like the first one in on September 6, but check their Facebook page to make sure. A practice session like this is the best way to get prepared for cross season! Apparently the secret is using a really long stem. Et voila. Here's a video of Thomas Frishknecht sprinting to silver on flat bars in the 1997 world championships. The 2012 Arkansas Super-Prestige (ASP) cyclocross points series will be contested over eight races in central and northwest Arkansas, running from October through December. 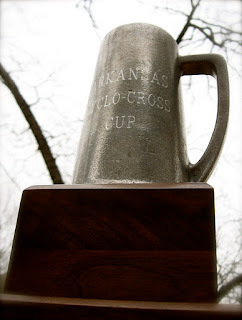 Medals will be awarded three-deep in five race classes---Open, Women, Fours (USA Cycling CX category 4), Masters (40+), and Juniors (18-)---and the overall highest-scoring team will be awarded the Arkansas Cyclocross Cup. 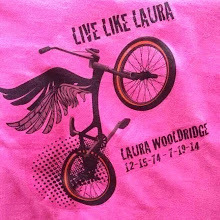 Cyclocross ("CX", "cross") is a 30- to 60-minute bicycle race covering a roughly one-mile closed circuit of mixed terrain including pavement, grass, gravel, and dirt. Racers are forced to dismount and portage their bikes over a variety of hurdles, log-piles, or steep ravines, earning the sport its reputation as "the steeplechase of cycling." Because of its unique challenges and spectator-friendly nature, cross is the fastest growing form of bike racing in the U.S. The ASP season opens with a weekend of racing in Little Rock. On Saturday, October 13, the ASP Night Race takes over Kanis Park for fast and exciting racing under the lights, followed on Sunday with Reservoir Cross, over a tough, hilly, rocky circuit in Reservoir Park. The entire season is listed below. Bookmark www.arkansascyclocross.com for the latest ASP news, a complete set of series rules, and ongoing coverage of the races. The cross-monkeys are hard at work making this year the CXbest ever. The series calendar is holding steady. We've got several generous sponsors lining up to give the Arkansas Super-Prestige points series its first cash purse. We'll be rolling out the finalized calendar, series rules, and prize schedule in the next couple weeks. These hot months are a great time to get low- to moderate-intensity mileage done. The better your tanline in September, the better your performance in December. Carry plenty of water and salt. Wear a cabbage-leaf under your helmet to keep your head cool and sunburn-free. Be happy in the swelter.